In the curve tab, the catenary command is used to create an arch from identified points. The command does this first by inputting your selected points whether it is single points or points divided on a line/curve into (A) and (B). The export side of the command requires a curve plug in to connect the points with a catenary curve: the graph of the hyperbolic cosine function. This would probably be helpful when designating a continuous arch pattern lofted from a single curve or looking at the efficiency of a structure in tension verse compression. 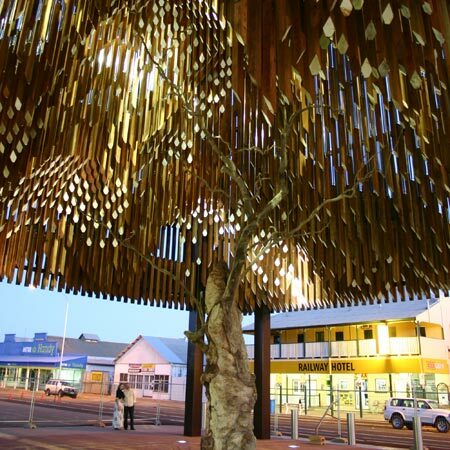 Australian architects M3Architecture and Brian Hooper Architect have completed a memorial to a tree in Queensland, Australia. The “Tree of Knowledge” was a ghost gum tree, revered because it is said that during the 1891 shearers’ strike the Australian Labour Party was founded under its boughs. In 2006 vandals poisoned the tree with pesticide and it died soon after. The vaulted, lit structure represents a chapel memorial and the similar repetition of elements calls to mind fields of tombstones. 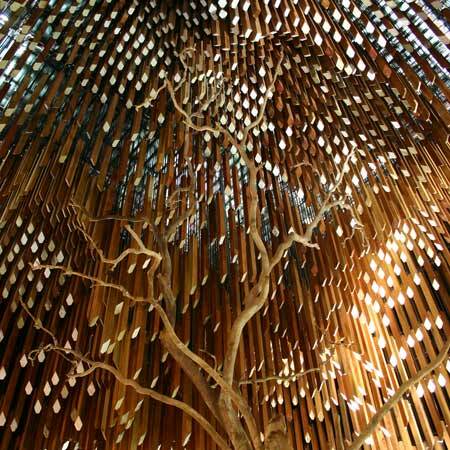 The “Tree of Knowledge” addresses issues of lighting throughout a massive structure. At night the memorial is illuminated and creates a popular meeting place for social exchange. The structure uses parameters to define lighting in a unique way to highlight a memorial. The original root ball of the tree is preserved and showcased to visitors through a glass floor panel located under the canopy. How do you create a gateway, landmark or sculpture (seen and recognized from a far) with out creating light pollution?